Roz Mortimer is an internationally recognised artist and filmmaker based in London. Since 1995 she has been producing award-winning moving image works that have been widely shown around the world in cinemas, galleries, film festivals, online and on television. 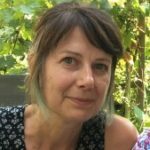 She is a researcher in the department of Media, Art and Design at University of Westminster, has an MA in Visual Sociology from Goldsmiths and lectures at universities in the UK and USA. Her work has been supported by Arts Council England, Wellcome Trust, Rockefeller Foundation, British Council, Film London, Animate Projects, and Channel 4 Television. Roz’s work is focused on expanded and experimental forms of documentary which blur the boundaries between staged theatre and documentary whilst challenging our social and political understanding of the world today. It’s About to Rain; This is History (after all); Sites of Memory; The Flayed Horse; Passages; Invisible; Tales From the Arctic Circle; Safety Tips For Kids; Dog of My Dreams; Wormcharmer; Bloodsports For Girls.